I love cloche's and I'm not sure when my love affair with them began but one by one they came to Linderhof. Most are different and all were on sale. I love the fact that most of them are blown glass which gives them imperfections. At Linderhof, nothing is perfect. And although we mostly use the cloches indoors, sometimes they do go out in the garden -- in fact I like the look of them in the garden! So I was thrilled to join Marty for her Cloche Party. Visit A Stroll Thru Life to see the good things that everyone puts under glass! My first cloche is a wee one -- bought at Nell Hills and the rabbit came from another store that I adore -- J'Adore in Kansas City. It's always been in the bedroom and right now I love it on the end table. Front porch summer time has two of the cloches -- a paper mache bird in one (which looks old but isn't -- a Nell Hill's purchase and a favorite) and a bird's nest in the other. I like the way that they balance the gnome at the other end of the metal table. 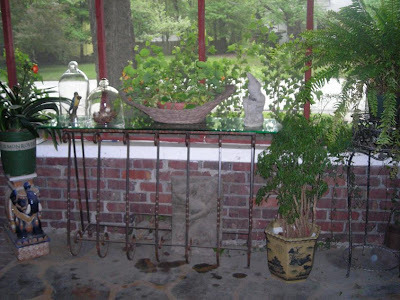 I like the different elements -- basket, green, concrete, glass. 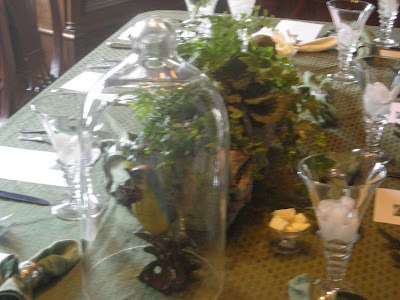 Sometimes the robin and his glass dome come in for a table decoration. He's as handsome inside as he is out. 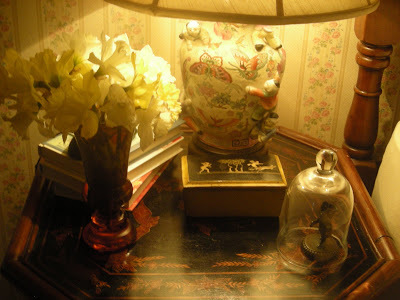 Two cloches that match -- from Pottery Barn on a deep sale bought because of Bunny Williams book, An Affair With a House, and the two cloches in her living room with antique French silk plants under them. I was lucky to find these two planters with silk plants and although they have some age on them they are neither French nor antique. I'm hopeful that Ms. Williams would not mind my copying her idea. They moved around a bit -- although they did start in the living room and no matter where I put them, I do like them. And four of my favorite cloches. Under which all I put is the rhubarb. Four Guy Wolffe rhubarb forcers. They look great in the garden. And they're functional as well! Your clay cloches are my favorites. They would look great in the garden. I would like to have some just like yours. Did you get them at a garden center or from a catalog? I found them on line -- Smith and Hawken carries them as well (but I got mine elsewhere) -- the picture was taken in the winter and they were on the porch -- for they normally live in the garden -- at least 3 seasons of the year! Love all the decorator ones also!! ooooh, love the clay cloche! Beautiful cloches! I love the flowers under them. 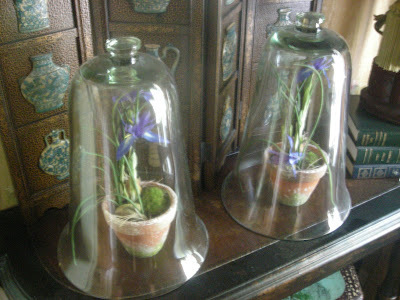 Love them all - You have some beautiful cloches. Thanks for sharing. Beautiful and those clay ones are so unique ! Beautiful cloches my friend..love how you use them outdoors as well and those garden ones are so unique!!! The two with the silk plants are just gorgeous!!!!! Thanks so much for sharing such pretty inspiration...have a great weekend! What a lovely selection of cloches you shared. I do love the two matching ones. You know copying is the highest form of flattery. She should be honored. I love the variety of cloches you have Martha! I am getting so many ideas...for when I finally have a cloche! I love the bell shape one's and the flower inside very pretty. I like the way you decorated all of them. I love the wire table on your porch. The cloches on it do look lovely. I'm never saw the terra cotta ones used to force rhubarb. That is something new to me. Thanks for sharing. 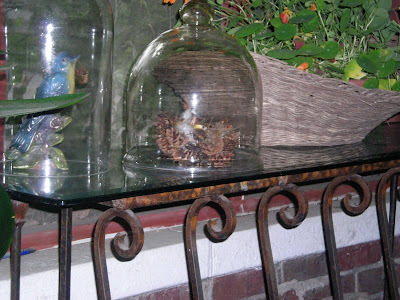 Sweet cloches throughout your beautiful home and garden! I love the clay cloches!!! Love the cloches. My favorite is the 2 taller ones with the silk flowers. I have never seen clay cloches. Cloches are just starting to appear up here - in fact I was in a decorating store last week and asked for one and was told 'not yet, but soon'. So I'm heading down towards Seattle next week and will have to check out Pottery Barn and other places. I can think of lots of ways to use them - but will just pop back here for more ideas! A terra cotta cloche! Sounds as good as it looks. And I am loving the way it looks. I'd love to find some for my garden. Where oh where did you find them? Thank you so much for showing us all of your beautiful cloches...you have quite a collection there, my friend! But I love them all! I've never seen the clay cloches that you call "rhubarb forcers"...of course, I must admit that I don't know a thing about growing rhubarb! There's something so romantic about cloches! 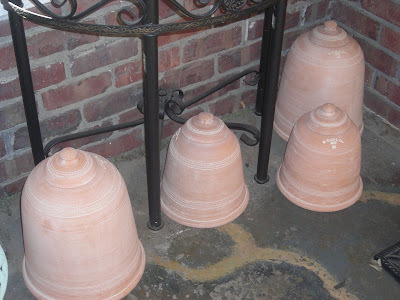 Love your collection - I've never seen the clay cloches - those are cool. So far I think you're the only person I've seen who really truly uses them as intended. These are wonderful, Martha! I love the clay cloches!! Nice cloche collection, great displays! I love the small one...it's so sweet!